Summer is here! And so are the vacations! Get crafty this summer and make the best of the vacations. Try out these simple, quirky and creative newspaper crafts with your children and make some wonderful memories for life. Newspapers are the easiest craft supplies that are always available in hand. 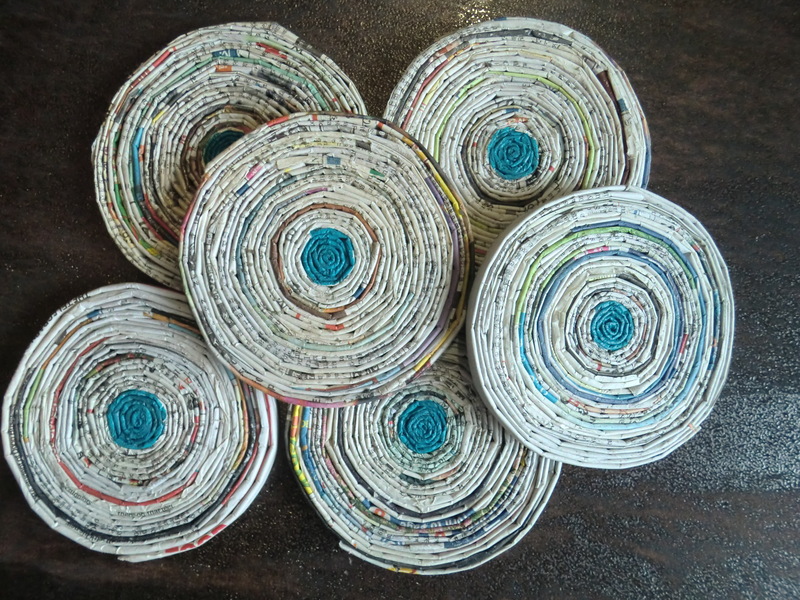 Using newspapers for art and craft work is the best method to recycle and reuse them, instead of just throwing it away. There are hundreds of simple and easy DIY art and craft ideas which you can do and work along with your kids. Here are the top 10 newspaper art and craft ideas which you can explore with your little one. Whether this is the first time or if you are already an expert, these galore of newspaper craft ideas are going to excite you and your child. So, get your hands crafty and bring out the artist in you. Not wood or plastic, imagine a wall art made simply with newspapers. Materials Required: Old newspapers, glue, paint, scissors, and thread. Instructions: Cut the newspapers into strips to make the cornets. Paint the cornets with your favorite color. Roll up the cornets and apply the glue on them. Circle the paper rings together with a strong thread. Connect large circles with different sizes to get a huge wall art. And your simple and easy wall décor is ready to go on the beautiful walls of the kid’s room. Materials Required: A recycled paper bags are always loved by all. Eco-friendly and easy to carry bags. Things Required: Two Sheets of Newspaper, scissors, card-stock, glue, punching machine, and strings. Instructions: You can make the bag of any size. Place two sheets of newspaper on top of each other to give a sturdiness to the bag. Cut into a rectangular piece depending on the size needed. Fold a flap in the down and up from the bottom. After this, make a vertical fold on the front and back section. Cut two pieces of card-stock and stick them to the widest section. Stick the top flap down covering the card-stock. Ensure you glue both the flaps. Stick the outer flaps together and tack it up tightly. Just like gift wrapping, fold the small side and crease the folds and stick it together. Place a card-stock in the bottom of the bag and stick it tightly. Using a punching machine, punch holes at the open end and attach the strings through the holes. Put knots at each end of the hole so that the thread doesn’t come out. And your stylish and eco-friendly newspaper bags are ready to use. These beautiful and creative floral wreaths are a great décor piece for the entrance door of the house. 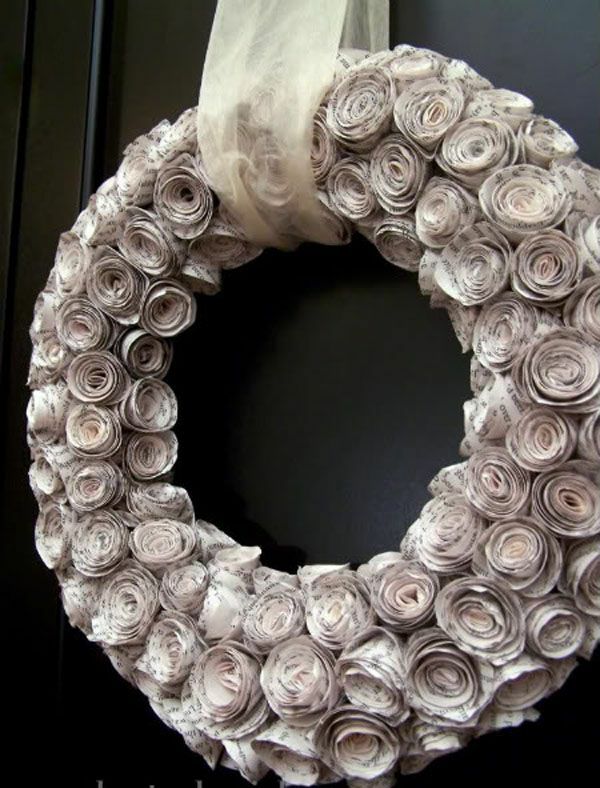 Materials Required: Old Newspapers, old foam or tube, hot glue, pen, scissors, ribbon, and spray paint. Instructions: Take few newspapers and draw spiral using the pen. Using scissors cut them into a spiral shape. From the outside of the spiral paper, roll the paper inward and make a beautiful newspaper flower. Make lots of such newspaper flowers and keep it aside. Spray paint the old foam or wreath with your favorite light color. Using the hot glue, stick the flowers on the painted foam or tube. Ensure it is stuck tightly and no painted space is visible. Tie the ribbon and hang the attractive newspaper floral wreath as you please. 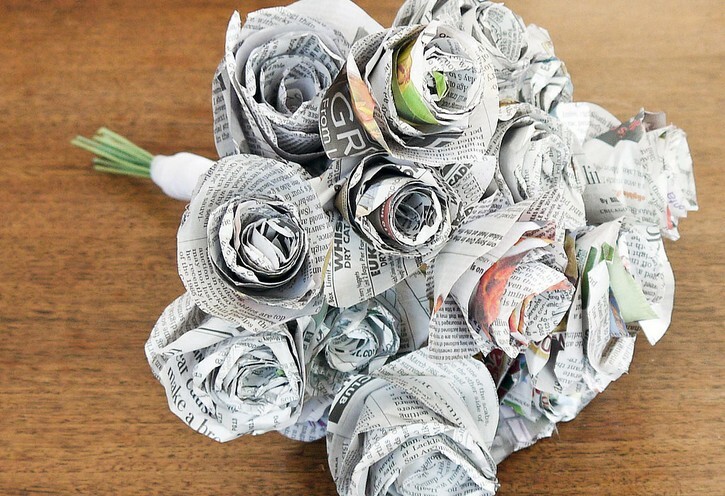 Get a recycled newspaper bouquet made in just a few simple steps. Materials Required: Newspapers, scissors, hot glue gun, ribbon, and floral cloth wire. Instructions: Cut a newspaper circle of 8 – 10 inches in circumference. Ensure you allow an inch border around the cut. Roll the paper from the outside to the inside till the center. Press down the edges to create a curled petal finish. Using the hot glue stick the bottom of the flower. Take the floral cloth wire and stick it with a hot glue into the bottom of the flower. Repeat this till you have sufficient flowers to make a bouquet. Bunch all the stems together and trim the end of the floral cloth wire. Using the ribbon wrap the flowers and stick it with the hot glue. And your newspaper bouquet is ready to go. Ditch the plastic baskets. Use these beautiful handmade paper baskets to keep any dry products. Weaving is an age-old art which depicts the beauty of the fingers. Materials Required: Old Newspapers and glue stick. Instructions: You will require 10 – 12 pieces of newspapers. Cut them in the center and roll it firmly. Once rolled, flatten it neatly. Stick the open ends of the newspaper with the glue. Ensure all the sizes of the flattened newspapers are the same. Lay four paper reeds on the table and weave other four reeds through it. Make sure the woven part is in the middle. Fold the ends of the reeds. Take another newspaper and weave it along the woven part. Stick the overlapping ends together using the glue. Three to four layers of weaving would give you a moderate size of the basket. Fold the rest of opened up reeds inside the basket. Trim and tuck the extra loose ends and your beautiful basket is ready. You can also paint it with your desired color if you wish to. We all love newspaper hats. Our childhood was filled with the colorful and vibrant newspaper hats. Let’s relive them again. Materials Required: A sheet of newspaper. Instructions: Ensure the paper isn’t square. Turn the paper and make sure the longer sides form the rectangle’s height and not its length. Fold the paper in half along the long side and turn it so that the fold is on top. Then again fold the paper from left to right to make a center crease and then unfold it. Now, fold the top corners diagonally and the edge of the fold meets the center of the crease. Pleat the face-up bottom edge of the paper up to meet the bottom edge of the triangles, then wrap up again to form a cuff. Flip the hat over and repeat the cuff fold on the back side to finish. 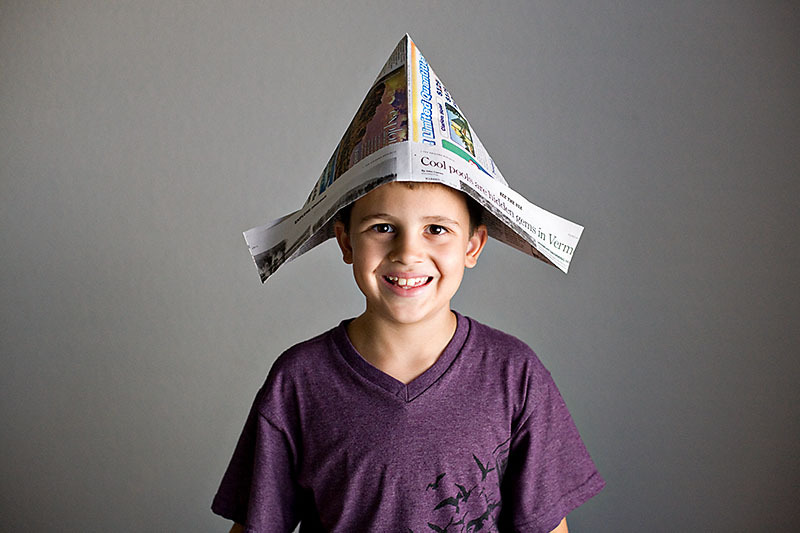 Your super cool newspaper hat is ready to wear. Isn’t a paper ornament taking you down to your childhood memory lane? 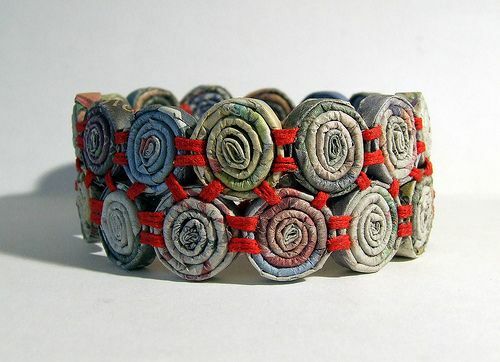 These simple and stylish paper bracelets are the most creative craft which kids love to do. Materials Required: Newspaper, scissors, color paper, glue and tape. Instructions: Fold half the newspaper and roll it tightly. Secure it firmly with a tape. Cut the color paper into specific shapes of your choice and stick it on the newspaper using the glue. Measure the wrist and then cut the length of the newspaper bracelet accordingly and tape it firmly so that it sits on the wrist rightly. A table coaster made out of newspapers just adds the right touch to the dining area. Materials Required: Old Newspapers, scissors, glue, paper clip. Instructions: Cut long strips of newspapers of ¼ inch in width and flatten the same. Smear the glue all over the strip and stick the edge. Create as many strips as possible before you begin the rolling process. Apply the glue on side of the strip and using the paper clip, roll the strip along with it. The paper clip would help it to keep the center intact. Keep sticking all the strips one after the other in a smooth fashion. Continue wrapping the strips depending on how big the coaster you want to have. Once done, ensure you dry the coaster overnight before you begin using it. Irrespective of the season, trees, and leaves in art and crafts are very easy and comforting to make. Go ahead and make one. Materials Required: Fresh leaves of different shapes, newspaper, crayons, twine, scissors, and punching machine. Instructions: Place the leaf on the newspaper and trace the outline of the same. Using the crayons, color the leaves. Now cut the exact outline drawn in the newspaper. Do it multiple times depending on the length of the leaf streamer. Now using a punching machine, you can make a hole at one end of the leaf. Tie all the leaves inside the twine and hang it around the window or on an empty wall. 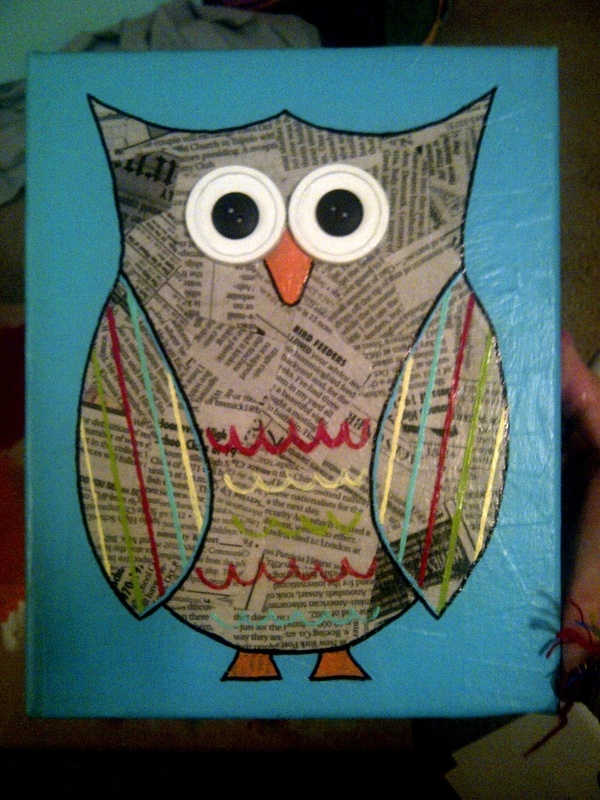 Bright and beautiful owls which are the perfect idea for a newspaper craft. Materials Required: Old Newspapers, plain white paper, watercolors, paintbrush, orange construction paper, googly eyes, markers, glue and scissors. Instructions: Cut a half of the newspaper and let the children paint the paper as per their choice. Make it dry and it would get stiffen. Cut the shape of an owl body from the newspaper and place it aside. Cut a half oval shaped papers that represent the wings of the owl and two circles for the big and bold eyes. For the eyes opt for a plain white paper. Cut the orange construction paper into a small beak of the owl. Now, place the eyes, wings and beak on the painted paper. Stick the googly eyes on the plain white eyes. Using the marker draw the curvy lines in the wings of the owl. Your super cute owl is ready to play. 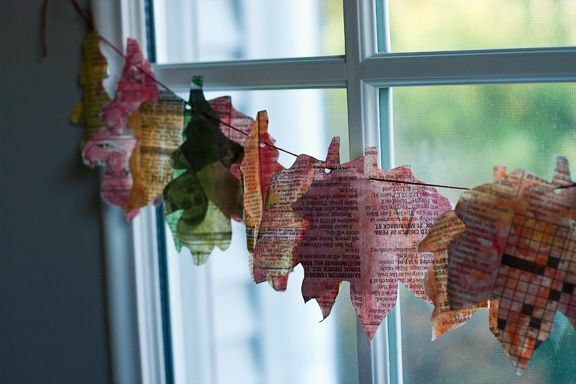 Are you allured by these awesome newspaper art and craft ideas for your kids? Which one is your choice of craft? Make them and do with them. Cherish this wonderful time of your life, for this, shall never come back.